Genetic Engineering Pros and Cons: Genetic engineering is providing one of the most important means by which crop plants will be improved in the future. It has a distinct advantage over recombination of plant genetic material brought about by natural and somatic hybridization because it allows Individual genes to be inserted into organisms into a way that is both precise and simple. In addition the species involved in the gene transfer do not have to be capable of hybridizing with one another. 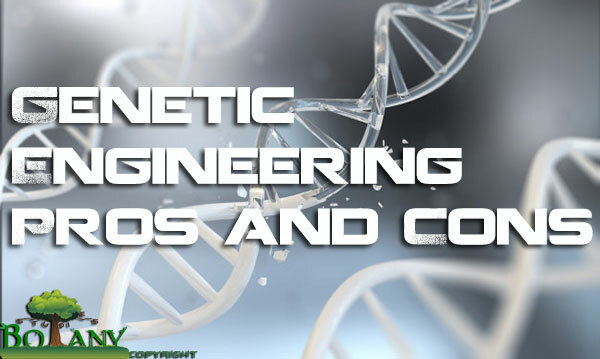 In view, there are different genetic engineering pros and cons mentioned below. Including the genetic engineering in agriculture, genetic modified food pros and cons, benefits of genetic engineering in agriculture, Genetic modified crops advantages and disadvantages. Plants have been engineered for resistance to several herbicides, including glyphosphate, which work by blocking a single enzyme essential to plants for the production of aromatic amino acids. Although extremely effective and nontoxic to animals, glyphosphate kills all plants, including genetically engineering resistance into plants resulted from the identification of a mutant form of the target enzyme from the bacterium Salmonella that is blocked by glyphosphate. Transfer of this mutant gene into crop plants, using the Ti plasmid, resulted in plants that were resistant to the herbicide. Alteration in fatty acid biosynthetic pathways have been used to reduce the proportion of saturate fats in soybean (Glycine max) and canola (Brassica napus). Alterations in the starch content of potatoes (Solanum tuberousum) and the nutritional quality of protein in maize kernels are being developed. Gene transfer is also being used to produce desirable products that plants do not normally make. The possibilities range from the production of pharmaceutical proteins such as vaccines) to the production of polyhydroxybutanol, a compound used to make plastic. Genetic engineering is used to alter the growth and development in plants. For example, genetically altered forms of ethylene biosynthetic enzyme have been transferred into tomato plants, resulting in diminished ethylene production and a significant delay in fruit ripening. Transfer of a mutant form of the ethylene receptor gene (etr 1-1) to tomatoes renders the fruit insensitive o ethylene. They may remain golden color 100 days after picking whereas untreated fruits turn deep red and begin to rot after few days. Such fruits can be induced to ripen by application of ethylene after they have arrived at market. Mutant forms of the ethylene receptor gene from Arabidopsis have been used to delay senescence or wilting of flowers. Transfer of the ethylene receptor gene (etr 1-1) into Petunia plants renders flowers insensitive to ethylene, resulting in an increased longevity of flowers. The flower from a transgenic plant is viable 8 days after pollination whereas flowers from an untreated plant wither 3 days after pollination. This achievement is of great interest in cut-flower industry. Genetic engineering has also been used to manipulate cytokinin production. The coding sequence of an Agrobacterium gene for an enzyme that synthesizes cytokinin was fused to the promoter sequence of an Arabidopsis gene that is expressed only in senescent leaves. When this chimeric gene was transferred into tobacco plants, the production of cytokinin in aging leaves dramatically delayed senescence. If this delayed senescence effect could be made to operate in desirable plants, a significant impact on yield might result. Geneticists have transferred genes from desert petunias into normal petunias, resulting in plants that require 40% less water. If such drought resistance genes can be transferred to crop plants, the amount of water needed for irrigation will be greatly reduced. A modified “ice-minus” strain, of the bacterium Pseudomonas syringa had been developed to reduce the susceptibility of certain crops to frost, and therefore allow early planting. Attempts are being made to Increase the availability of nitrogen, a limiting factor in crop production, by transferring genes responsible for nitrogen fixation into crops such as wheat and maize, which do not fix nitrogen. Genetic engineering pros and cons are being debated. Some questions are quite philosophical, for example it is ethical for humans to alter a species or does the species have the “right” to evolve naturally? But as genetic engineering have already begun, let us discuss risks of genetic engineering. The introduction of gene for herbicide resistance leads to eradication of weeds. However, it would decrease the amount of land required for agriculture. The bare land may become site for weed development that might allow even heavier uses of herbicide, thus increasing the amount of chemical residues in soil and as a result in our food, possibly with unknown serious health risk. Similarly, the introduction of gene to produce toxins that resist insect into the corn plant also poses problems. The toxin is also produced in pollen of genetically engineered corn plants, and because corn is wind pollinated, vast amounts of toxic pollen blow away from the corn fields landing on the leaves of other plants, coating them with a poisonous dust. There is also worry that the corn’s pollen even contaminates the stigmas and nectar of other plants, harming their pollinators. And once the corn kernels have been harvested, the dead leaves and stalks are plowed under, taking bt toxin into the soil. Also plant engineered for drought resistance (Petunias) require less irrigation, so less water would be diverted from rivers and lakes, and surplus water can be used to irrigate arid land. Cultivation of barren land may help increase food production. The overproduction poses Problem of storage, and supply and demand problems.